The superstar singer is just one of many celebrities with their name on products — because it works. Richie is a four-time Grammy winner, with over 100 million records sold, so he counts a lot of people as “his” people. Baby Boomers and Gen X-ers danced with him during his “Brick House” days with the Commodores, then swayed to his “Endless Love” serenades when he went solo. Younger fans may know him as a judge on “American Idol,” or as father to Nicole, Miles and Sofia. Now, he has the undivided attention of a new fan: J.C. Penney, the struggling department store where Richie is introducing his new home goods collection. That’s right. 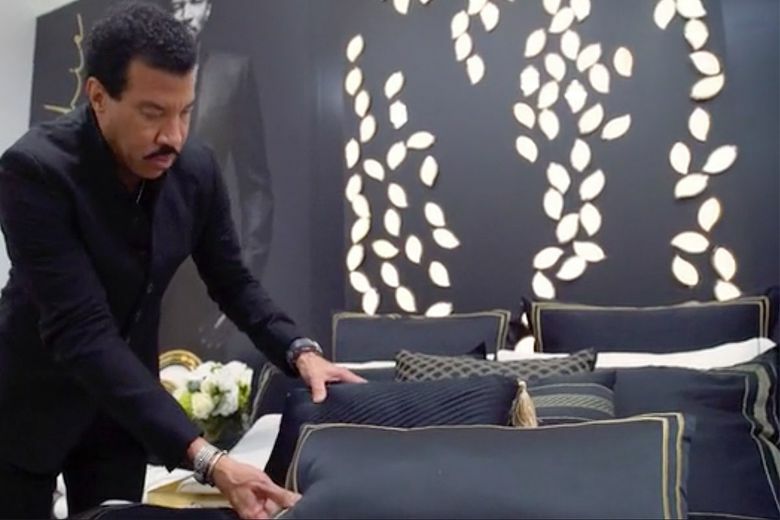 Lionel Richie, the 69-year-old multiplatinum singer-songwriter, is debuting a line of sheets and towels, which will be available in stores beginning Sept. 7. With his entourage and a camera crew in tow, he made a three-hour stop at the J.C. Penney campus, where he tried to excite the sellers of his black satin comforters and gold-embroidered pillowcases by, among other things, handing out two bouquets of roses and crashing a meeting of the board of directors. The grand finale was the gathering in the rotunda. As the initial applause and cheers died down, Richie leaned on the wooden railing and shook his head, almost laughing. “This is absolutely insanity,” he said. Which is what you may be thinking, too. An explanation is forthcoming, but first the puns: Hello, is it zzzs you’re looking for? After a night of Dancing on the Ceiling, you can climb under this comforter and sleep All Night Long. Richie, once a Penny Lover is now a Penney lover — and he’s coming for your linen closet. To understand how we got to a place where we could collectively climb into bed with Lionel Richie, consider the threadbare, well-worn path of celebrity merchandising. Many stars have product lines; some simply license their names, while others are intimately involved in design. Stores often demand the right to exclusively sell these product lines in order to ensure a lock on each celebrity’s fan base. Pop stars tend to gravitate toward creating their own clothing and accessories lines, where a few oft-cited individuals have had considerable success (see: Jessica Simpson and Victoria Beckham). Home goods make sense for the Rachael Rays and Martha Stewarts of the world, but it is something of a new frontier for musicians, and a strategic one. The category attracts a broader customer base, with looser ties to age or a gender, and presents much less fashion risk. A set of sheets can sit on a store shelf for months. A strong-selling towel can stick around for years. Facing declines in traffic, department stores like J.C. Penney are betting on star power to attract shoppers. Before hitting the sheets with Richie, J.C. Penney carried bedding collections from actress Eva Longoria and model Cindy Crawford. It also plans to sell bedding by Ayesha Curry, a foodie and the wife of NBA player Stephen Curry, this fall. The store is especially excited about Richie’s line, which will be manufactured by Sobel Westex, the Las Vegas-based textile manufacturer behind Sleep Like a King, the bedding collection by Larry King and his wife, Shawn. Executives see a strong correlation between the core J.C. Penney shopper — a woman over the age of 45 — and Richie. His E-Score, a ranking of a celebrity’s marketability from E-Poll Market Research, is a near-perfect 98 out of 100. Nine out of 10 people over the age of 55 recognized his name, and 97 percent said they liked him. Among the top attributes women assigned to him were “talented” and “good energy.” It’s not far off from Richie’s own sense of his brand, which he says is love. To guys, he is a musical wingman; to ladies, a swoony crooner. If you’re still thinking, “Home goods? Really?” that’s OK. Richie’s friends have said the same thing. “I’m actually enjoying this,” he said. From an ornate sitting room in his home in Beverly Hills, California, Richie explained it further. “I was desperately trying to get the next hit record,” he said, when he reached a point of wanting something new, an additional outlet for his creative energy. He had his team reach out to Walter Pelaez, the chief executive of Sobel, and they had dinner together at Richie’s house on Valentine’s Day in 2017. There, “the magic started,” Pelaez recalled. They spent all night long — just kidding, it was more like several hours — talking through the possibilities. The J.C. Penney bed and bath line is the beginning of what Richie sees as a much bigger lifestyle brand, Lionel Richie Home, with more categories to come. It’s his second attempt in home goods; in 2016 he hosted a dinner party to introduce a higher-priced offering of glassware and china. That collection had limited distribution, according to a spokesman. The concept will be reimagined at more affordable prices in the future. His current line will be merchandised alongside color-coordinated pieces from J.C. Penney’s own label. If a shopper buys a Lionel Richie Home six-piece white-and-black towel set, on sale for $39.99, she could pick up a few solid black towels from J.C. Penney’s line to coordinate. The intermingling of brands was intentional: It ensures both parties are invested in the success of the other. The in-store setup that will be featured at 250 locations includes three photos of Richie: a head shot over each of the display beds and — the pièce de résistance — a life-size cardboard cutout of Richie standing between the two. The hope is that shoppers will see it as a selfie moment. Richie certainly did. During his visit to J.C. Penney headquarters, he jumped on stage unprompted to pose for pictures with his cardboard self. Later, in the rotunda, Richie declared that he would change the way people think about selling. “The only way to do that is you have to do something slightly ridiculous,” he said. “In life, there’s only one great bridge to the other side,” Richie said. “That is a sense of humor.” He sees it as a path toward relevance, and relevance as an alternative to retirement. At another point, he pretended that a drink that was handed to him by a crew member was filled with something strong. (It was Pedialyte). Around 10 p.m., after “Easy (Like Sunday Morning),” “We are the World” and every other Lionel Richie song you maybe forgot was his, the show was over. He walked offstage, shed his blue sequined “All Night Long” jacket and climbed into a black SUV, waiting to take him to his private plane. Lionel Richie was going home to sleep in his own bed.